We want to start development of Cryptomator 1.5.0 soon. This release has one single purpose: Redesigning the UI. We’d be happy, if you share your suggestions below. Maybe you have a good idea for the overall layout of the application or a specific control like the password strength indicator. Please use the “heart” feature to upvote any suggestions you like, don’t write comments showing your affection. Let’s keep the discussion focused on the topic. Simplicity: We want a single-window application that is self-explaining and only shows what is necessary. Consistency: We want one consistent design across all desktop operating systems that matches the color scheme of our mobile apps and website. Accessibility: While it is easy to add labels that can be read by screen readers, we must always keep in mind the navigation across the application: All controls must be reachable in a logical order where you expect them to be. How to automatically close Cryptomator after startup? 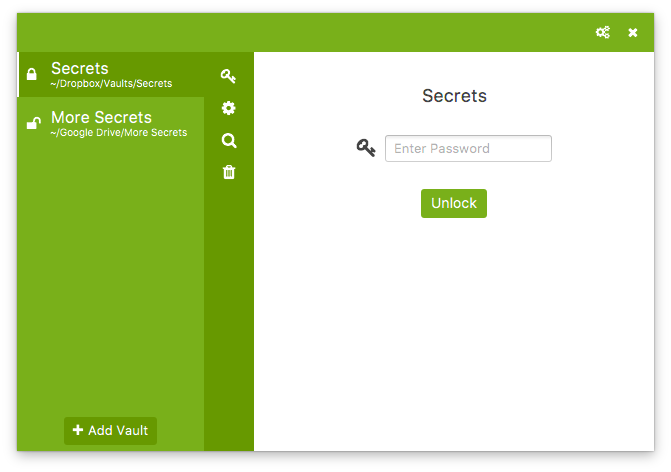 I’ll start by showing a first sketch featuring a flat design and a sub-menu per vault for unlock, advanced vault settings, reveal vault, etc. All icons get a tooltip, of course. Will the left pane be resizable? I have folders that have long paths and they get truncated ("…"). Have to hover over them and wait (I don’t like to wait). If not, could the ratio of left to right change (more left, less right)? There’s very little to show at the right and it’s fixed-length. (Maybe the buttons/icons open stuff in the right pane - which might need more space?) The old UI can’t be resized at all, so maybe if you just allow the entire window to be resized that would help. Here are a few (/a lot) of suggestions for future versions of Cryptomator. Some may be feasible, some may not. That would be nice. I already missed that function when playing around with some vaults. @Michael @city_zen You can reorder vaults. Thank you! Didn’t notice that yet. Being able to define custom themes via external css files should do the trick. We can then add “official” dark themes with one of the minor releases. Those issues seem crucial to me. IMO, considering the software purpose, it should not appear in taskbar/dock and be managed via system tray. If possible consistently across platforms, the best behaviour would be to appear in taskbar/dock only when the main window is visible (then allowing the user to focus it via ALT/CMD-Tab), and disappearing when the window is closed. I’ve seen it on Windows, but I’m not sure if that’s possible on macOS though (can’t find an app that I use that does it). Left click on the systray icon should open/close the main window, and right click be implemented with the current menu items “Open” and “Quit”. Additional items could be added, like “Unmount all vaults”. Currently, closing the main window when no vault is mounted causes the app to instantly quit. IMO correct behaviour should be minimize main window and go to systray. As pointed out by users, options to launch at startup, launch in background… should be available directly in-app instead of forcing the users to interact with OS-level configuration. I’m on macOS using Path Finder as a Finder replacement, and for a reason I can’t explain the folders are opened using Finder instead of Path Finder even if the command issued by your MacMounter class is “open” which when used in Terminal opens Path Finder correctly. I’m aware that this point is not relevent to most users but I think an elegant way to handle this and many other advanced usages would be to replace the “Reveal Drive” checkbox by a select field “On mount” with options “Reveal folder” (default), “Do nothing”, “Execute a command”. Selecting the last option would reveal a text field allowing the user to input a command that would be executed after replacing a specific placeholder by the directory path. An informative label should be present under the field to inform the user of the placeholder to use (e.g. $DIRECTORY). That would solve my specific issue (running “open -a ‘Path Finder.app’ $DIRECTORY” would do the trick), but would also allow users to easily run any custom scripts and hooks directly from GUI. If complex syntax (chaining commands with “&&”…) is supported by the underlying code, placeholder replacement should handle multiple occurrences. If this point can be implemented, it would be trivial and probably useful in some cases to have a similar “On unmount” field with options “Do noting” (default) and “Execute a command”. I’d suggest going as close to the AgileBits Knox interface as possible. 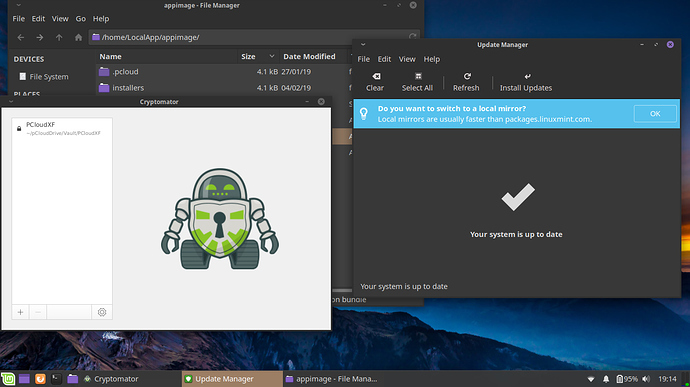 I would like Cryptomator to run as a service automatically after windows startup, with the password stored in the system as it currently is. A tray icon is all I need to know it’s working, and if I need to check or reconfigure anything, I just click on the tray icon. Could this be added in a future release?